We understand that selecting a right play set for your kids is not an easy job. Whether it is a swing or a slide, all types of equipment deliver equal joy to children. You must look for the one, which not only run high in fun factor but is also safe for them. An option is to go for wooden playground equipment. It is the safest and has leading edge over other sets made of steel, plastic or aluminum. Wooden playground equipment is made of cedar, timber and redwood, which are virtually splinter free, weather-resilient, pressure-treated and resistant to rot. This equipment is considered more durable as it does not decay like plastic play sets and does not corrode like metal play equipment over a period of time. It can easily withstand UV rays, extreme climate conditions and other weather hazards. The safe and sturdy features of this equipment ensure that kids can try out their physical strength and capabilities without any fear. 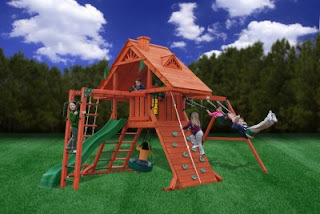 Before you choose any wooden play set, ensure that the manufacturer has designed it in adherence with the guidelines defined by American Society for Testing and Materials (ASTM) and Consumer Product Safety Commission (CPSC). With so many benefits, parents are also more likely to install wooden playground equipment in their backyard.